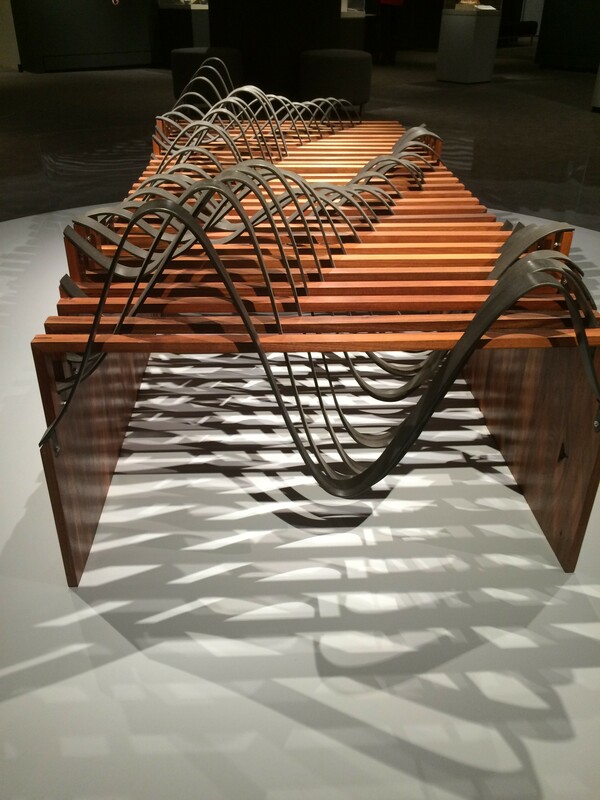 The Peabody Essex Museum (PEM) in Salem, Massachusetts is currently featuring an exhibition titled “Lunar Attraction” at their Art & Nature center. This show includes a diverse selection of art that relates to the Moon, in both the scientific realm, as well as the mythological. One of the scientific themes explored is the moons connection to the earth’s tide. Adrien Segal’s “Tidal Datum” from 2007 utilizes the numerical data from a tidal chart that maps the tidal patterns of the ocean in the San Francisco Bay. 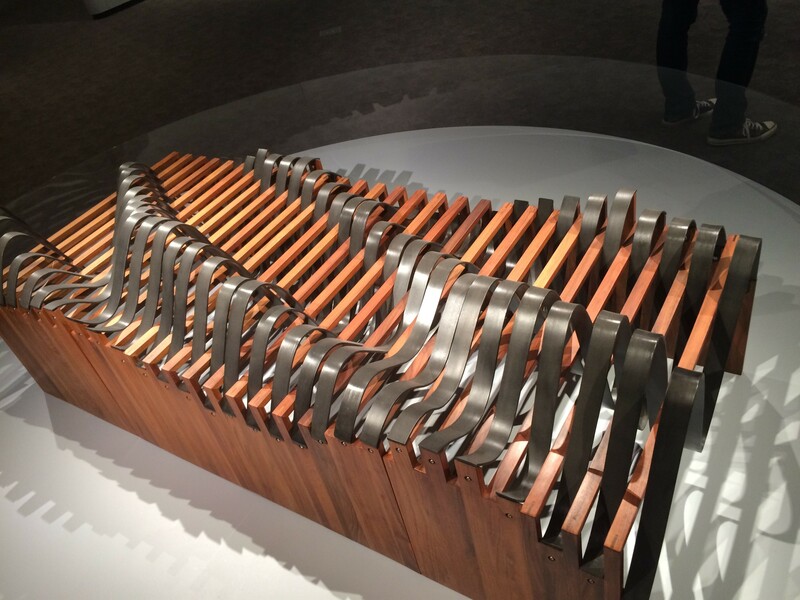 The undulating steel curves dip down the furthest and rise up the highest during new and full moons when there is the strongest gravitational pull. In this work the artist has directly transposed mathematical information into a aesthetic expression of a natural phenomena. 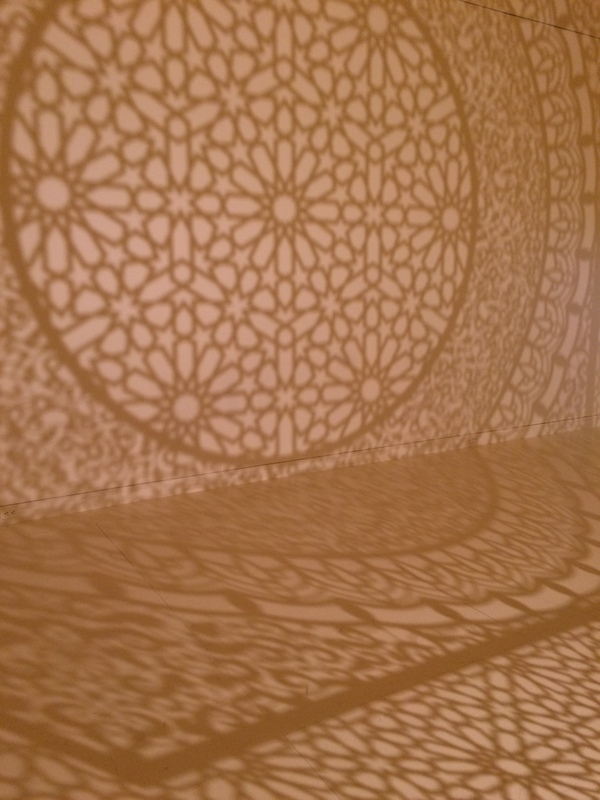 Anila Quayyum Agha’s installation titled “Intersections” is inspired by the intricate decorative elements she encountered in religious buildings as a child in Pakistan. The work consists of a laser cut steel cube lit from within. 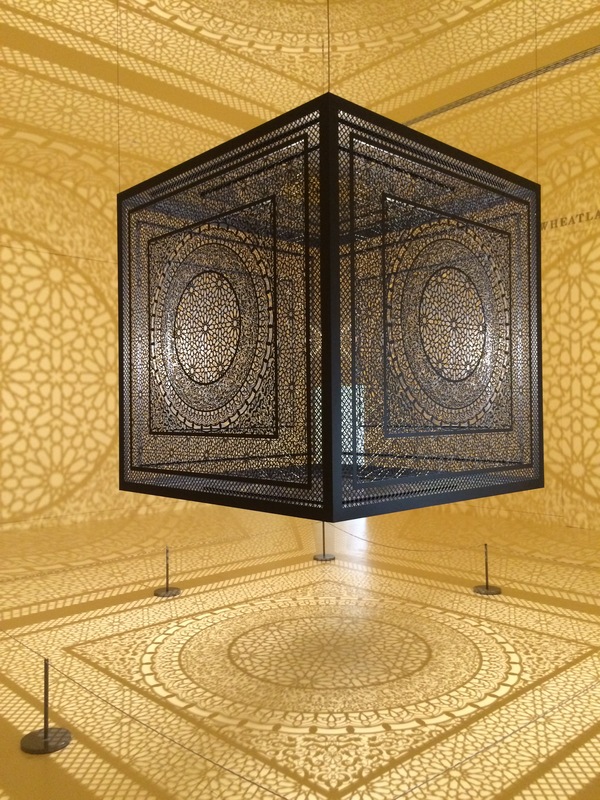 The lines of the lattice work on the cube are projected unto the painted walls, floor and ceiling of the gallery. The open work design is based on the geometric properties of Islamic patterning. Each side of the cube features a figure with 8-fold rotational symmetry inscribed with in a circle. These symmetries get disrupted in the projection onto the gallery surfaces. Especially along the lines where the walls and floor meet. The geometry on the cube is precise but the shadows must bend to fit within the boundaries of the gallery. 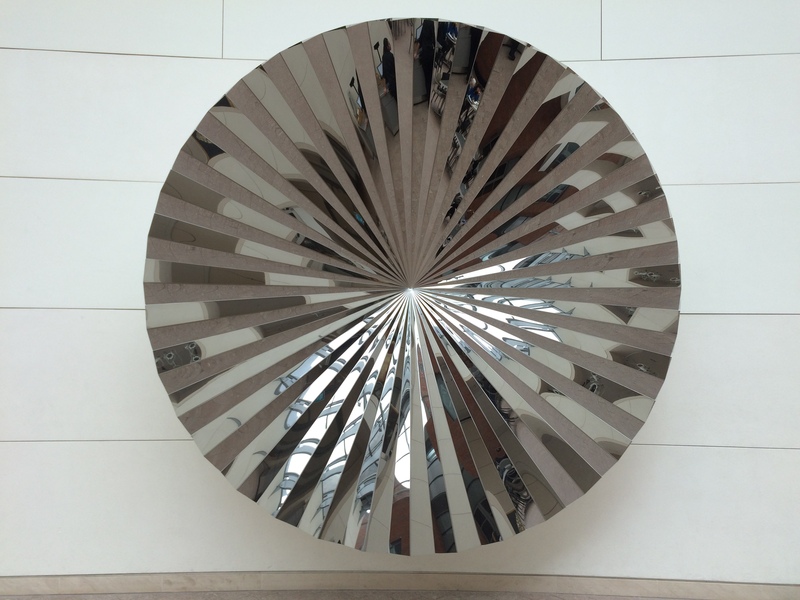 Anish Kapoor’s wall sculpture “Halo” is currently on display in the atrium of the Peabody Essex Museum in Salem, Massachusetts. The stainless steel construction from 2006 is a concave disc with accordion type folds.The narrow circular sections come together in 90 degree pleated folds. Although the stainless steel has a mirror reflective finish, when you stand in front of “Halo” you do not see your reflection. 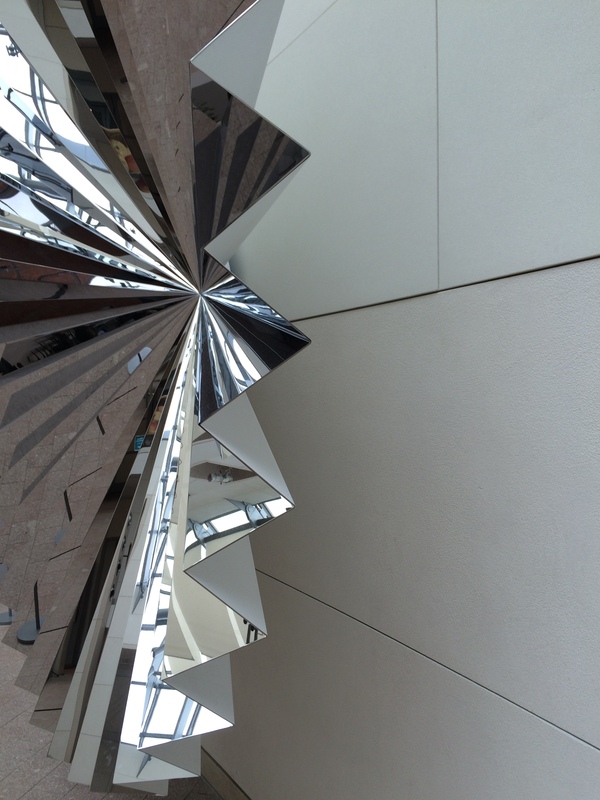 The angles of the mirrored sections face away from the viewer. Kapoor demonstrates interesting phenomena of concave surfaces, as well as the principles of folding within a circle.